(Newser) – A whole lot of East Coast florists are heartbroken today, facing the prospect of a Valentine's Day essentially ruined by yesterday's storm. One Maryland florist tells the Washington Post that the snow has grounded its delivery trucks, and that despite sending 300 orders out early on Wednesday in anticipation, deliveries would likely be backed up through Sunday. 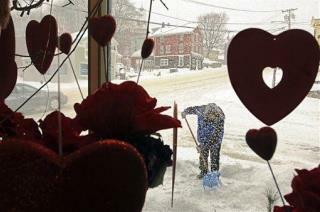 "We're now calling it Valentine's Day Weekend," the owner said. Sales were down, too, he said, because people "don't even think we can make a delivery." Forget the flowers. Along with the Valentine's Day card, I got my wife $100 worth of ITune cards instead and she enjoyed/liked them more.